Obaku’s Harmony collection includes 14 watches ranging from the V100G, centered above, to the V121G. Obaku’s focus is on simplicity, and even in their most complex timepieces they’ve achieved a simple, uncomplicated design. The name Obaku itself comes from a branch of traditional Zen Buddhism, which helps describe the designers vision for simple, basic living. The V112G, shown here, is a statement of minimalism on its own. Aside from the philosophical inspiration of the designers, this watch takes much from classic watch designs, especially the Movado Museum watch. This one takes that simple, bold look a step further from the Movado by removing any shiny band elements and keeps its basic simplicity. Check out the Obaku Harmony website to learn more about the watches, the philosophy behind them, and where you can buy them in the US. 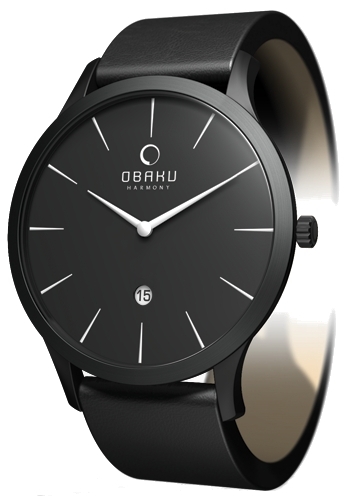 And stay tuned, we’ll be publishing an interview from the Obaku designers on Thursday! Comment on this pageâ€“ tell us which of the three watches above you like the most, and tell us about your favorite watch you’ve ever owned. Itâ€™s that simple. Best of luck GearCravers, and thanks to our friends at Obaku Harmony for joining GearCrave in this great giveaway. This contest will end on Sunday, June 1st 2008 at 11:59p.m. Winners will be announced the next day. Good luck!